So the roof vent was complete, and to say i was happy with it is a mssive understatement. I was really enjoying the race/rally theme i was building the car into. 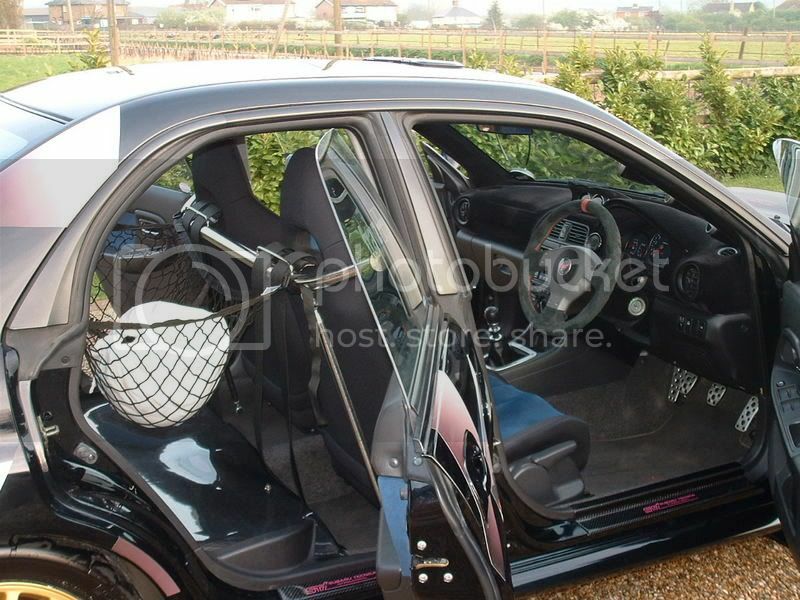 I had never seen them in the UK but frequently saw the use of harness bars in the US. 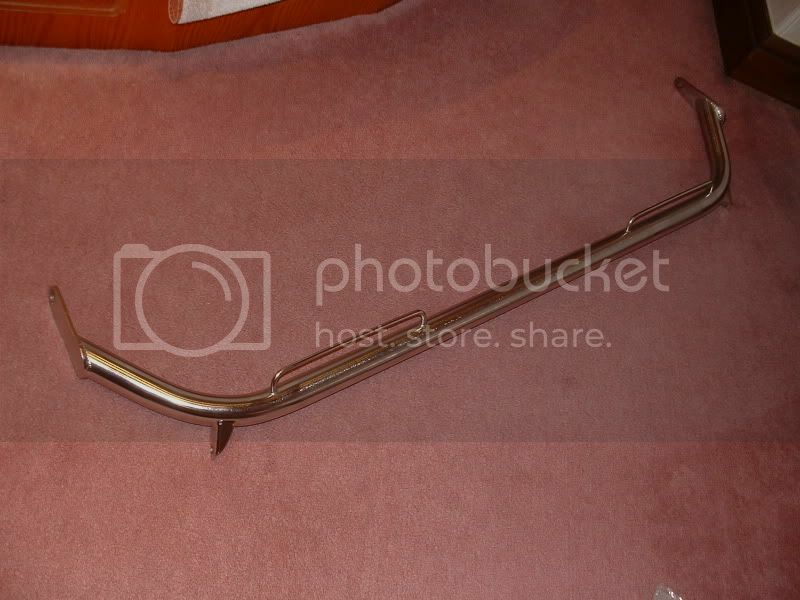 I contacted a company called Speedware in the US who fabricate stainless versions of the Sparco bar. Sure enough, the bar soon arrived, the guys had made a lovely job. 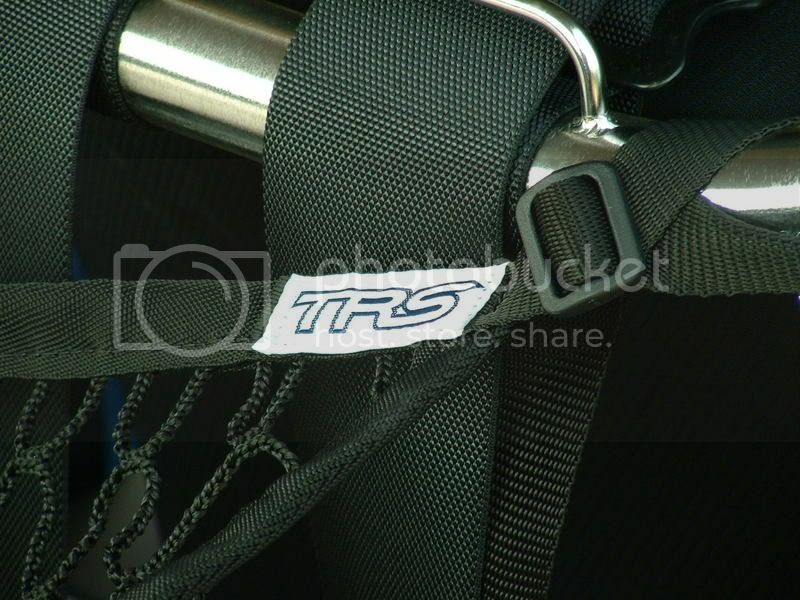 I also ordered some 3" FIA approved harness's from TRS. 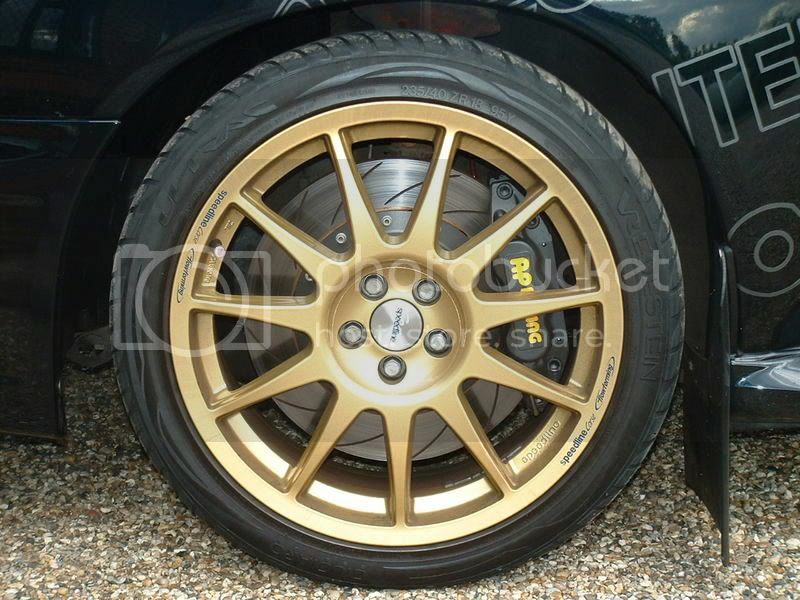 I opted for the WRC Magnum Ultralites which come complete with forged aluminium adjusters and buckles. 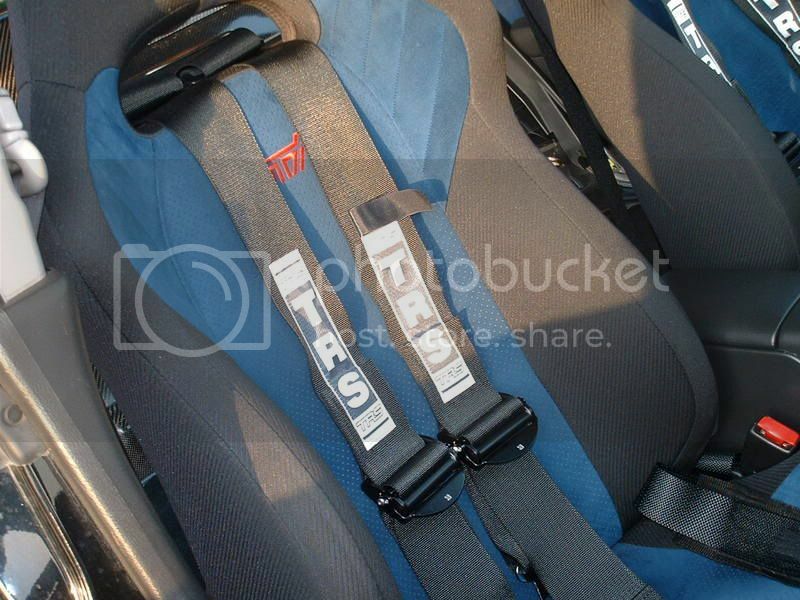 I had them do the lap belts in 2" and the shoulders in 3". Just for the sake of being more comfortable and user friendly. The car gets very little use and certainly no use of the rear seats so i decided it would be a good idea to lose the rear seats all together. However i didnt want it to look like a tatty stripped out racer. 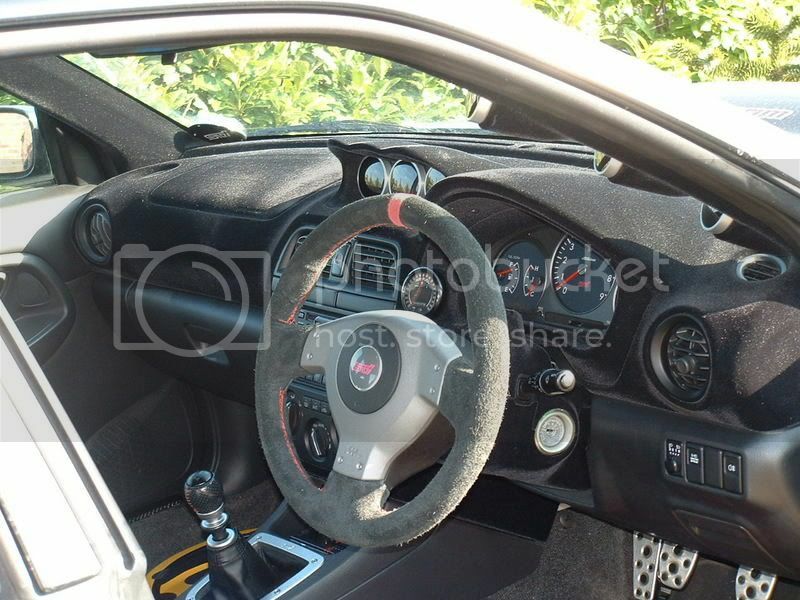 So i promptly contacted the guys at Ramsport in Wales. These guys built WRC and Group N cars and could supply me with the carbon panneling i needed to make the stripped out rear a clean and tidy job. 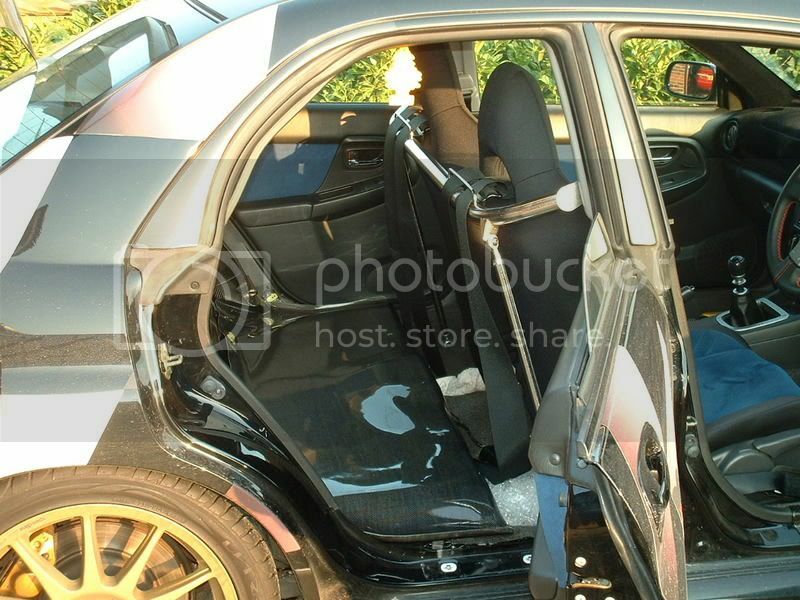 I decided to lose the parcel shelf too, rear seat bars, seatbelts... basically anything i didnt feel was needed got taken out. The carbon was a bit of a nightmare but worth it in the end. All the panels are feather light and well finished. Not wanting them to look toshed in i ordered titanium fastners and red button head panel washers from Aerotek so the install was as clean as possible. I used strips of very thin HD foam between the panels so they didnt rub and rattle. I also used RTV on all of the screws so they couldnt vibrate loose. 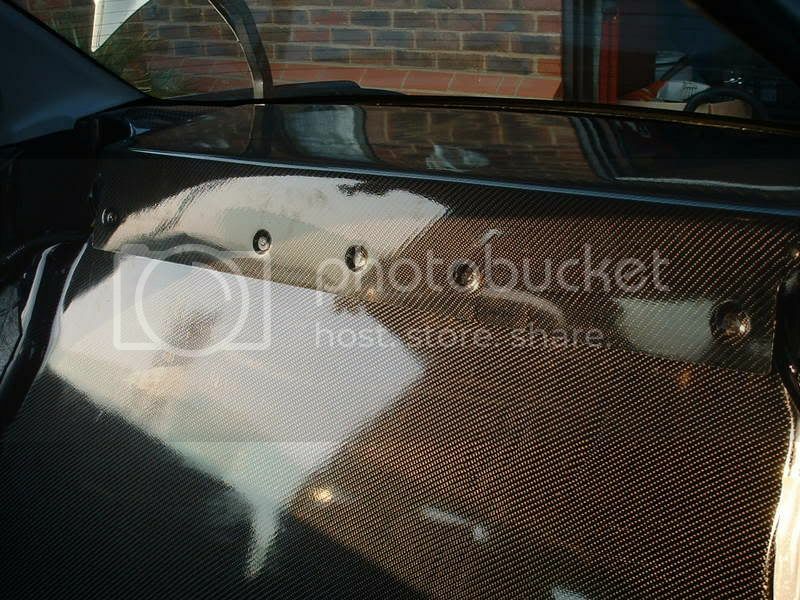 The edges were trimmed with 1mm rubber edge trim. The finished job is very clean and tidy and complemets the reast of the interior well. 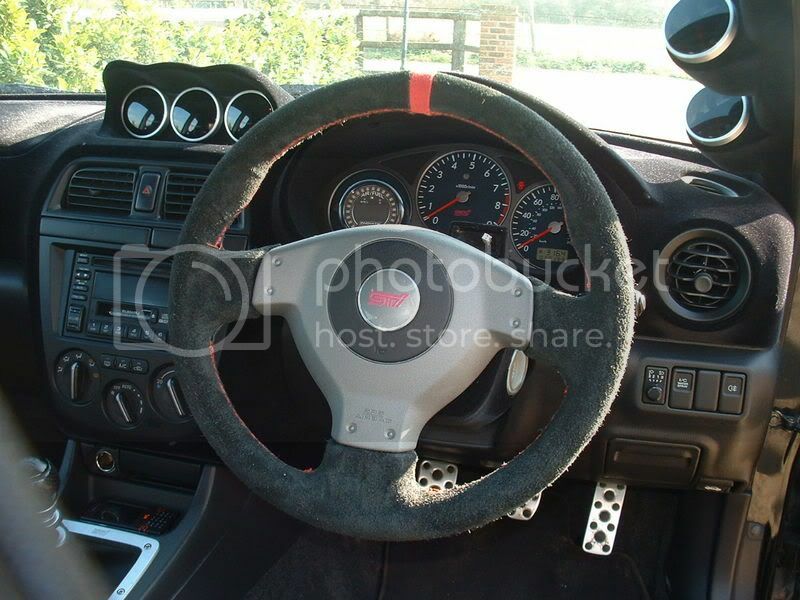 I also purchased yet another STI 8 wheel and had it trimmed in black suede just to add to the theme. It means i only ever drive the car with gloves on now... but its worth it for the fell. Another thing i made was a billet bracket for my fire extinguisher to be mounted under my passenger seat. 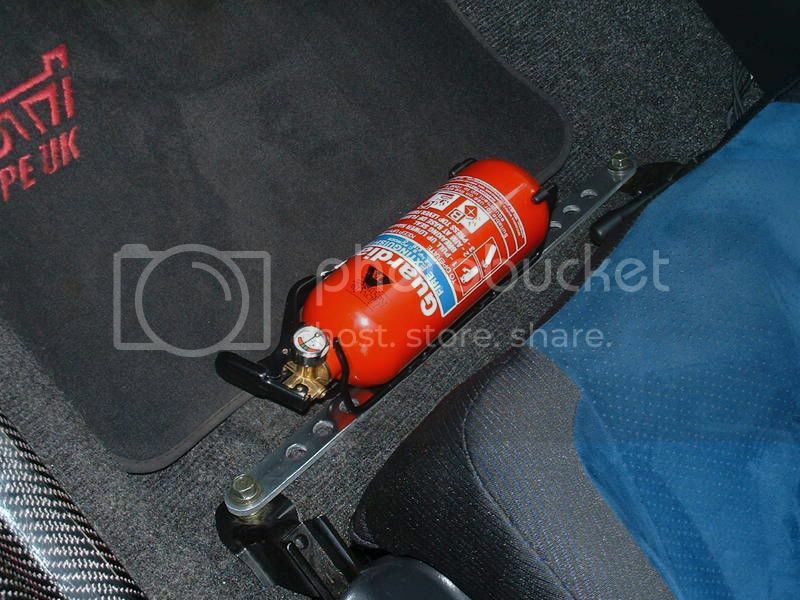 The seat still has full movement and the extinguisher is easy to get to. Last edited by frayz; 12 March 2008 at 08:37 PM. Frayz ... to get a comment from Martin like this is huuuuuuge. So well done on an awesome job!! Car is a beast! fair played to you mate, thats what i missed then its power at the wheels. Round 9 sees the car go back to the Nurburgring. Obviously she got the obligatory clean before we set off. The stock wheels went back on with some new Bridgestone RE070s. 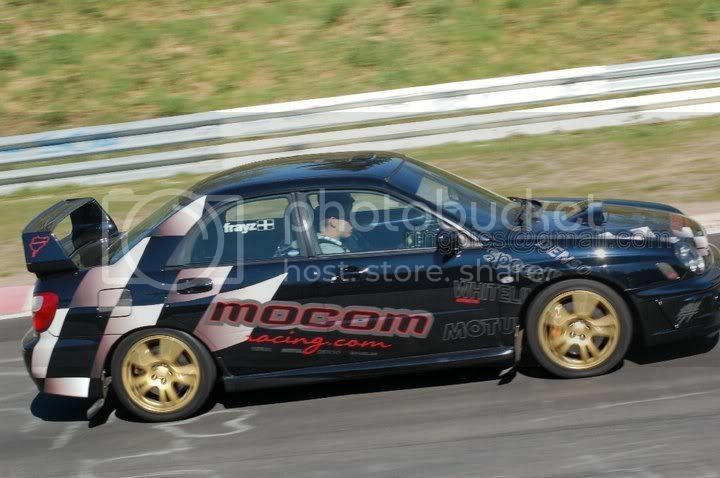 We got about a dozen laps in and the car was perfroming really well. With my limited track work we were running approx 9 min BTG times. 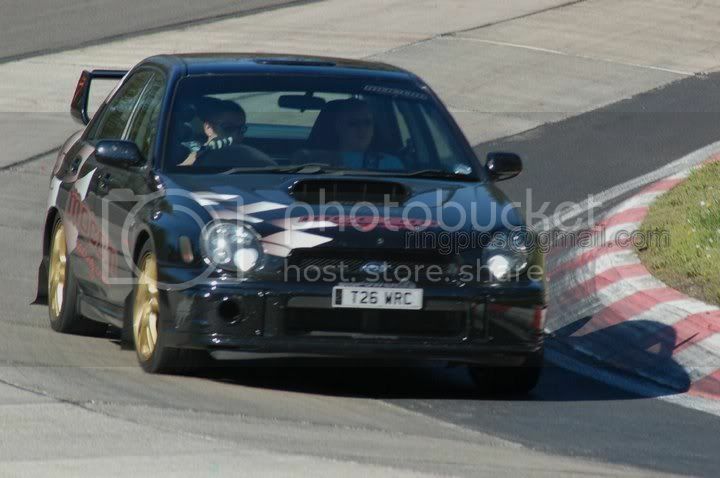 The car felt good and we passed a fair amount of quicker stuff. Everything was going really well until we heard the dreaded rumbling of what we later realised was a OSF wheel bearing... Disaster. 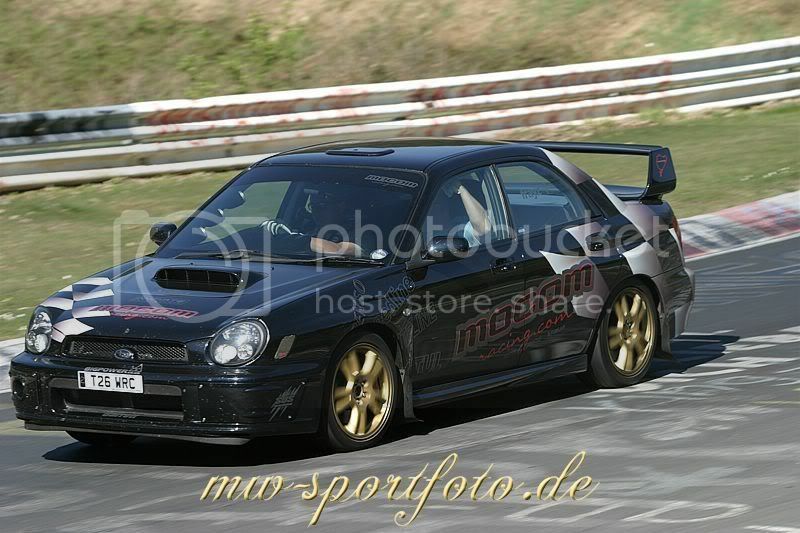 Now i dont know about you guys, but if youre looking for parts for a japanese car in Germany. You might have more luck getting a date with Elvis. It aint happening. We got the car back to the ringhaus (our local hotel) and proceeded to stip the car down. Basically we had got the brakes too hot and it had cooked the bearing, the NSF also showed signs of wear but not to dangerous levels. Big speeds, huge grip and hot brakes play havoc with wheel bearings. Here she is looking rather sorry for herself. We managed to track down a dealer in Daun that had a bearing kit and i was fortunate enough to have good friends like MADDOG who kindly drove Zak down there to get a new bearing kit. As you may know, Germany doesnt work on a Sunday but to our great gratitude we knew someone that could help us. Olly is a local mechanic in Nurburg kindly opend up his tuning shop (CS Nurburg) and pressed the new bearing pack in the hub for us. However the damage was quite severe and the bearing had damaged to driveshaft to the point that the out race on the bearing was not in contact with the shaft when pressed back on. A) Get it recovered by the ADAC where it would spend a possible 14 days in a pound before being trailered home. B) Fit the bearing and fit the hub nut in place and drive home at a snails pace. As you can imagine, there was no way that i wanted to be leaving the car in a pound unattended in Germany so we decided to drive her home. Once home, she was taken straight to Mocom. Here she was treated to all new bearings and brand new hubs. We decided the brakes were not up to the track use we wanted. 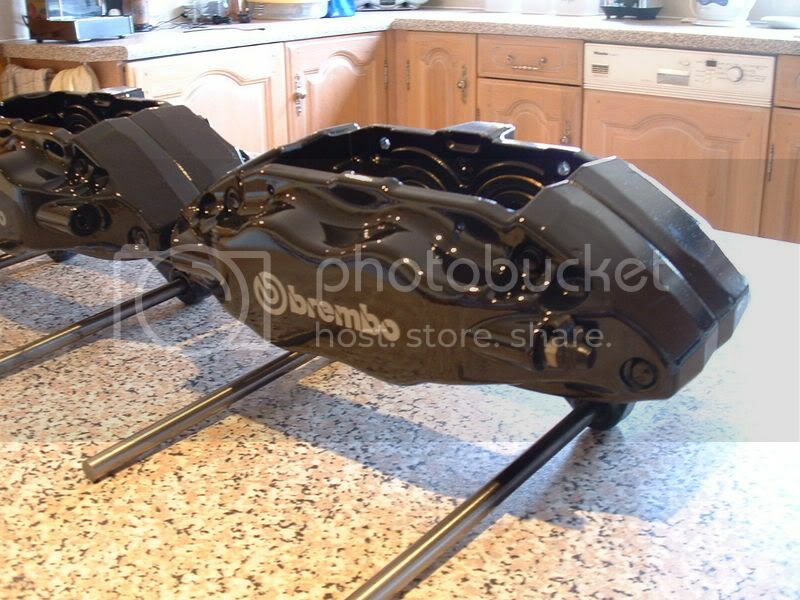 So a braking upgrade was further on the cards, the brembos were fully overhauled repainted and sold. Only painted due to a few sytone chips anyway. They looked better than new when they went lol. Round 10 sees the 4 month heartache that was the braking upgrade. Last edited by frayz; 12 March 2008 at 09:11 PM. So with the car back home all repaired but without any brakes, i go through what upgrades are available. I desperately wanted to be able to keep my 17 wheels as i just loved the RE070s on track. After investigating the like s of AP, Stoptech, Mov-it, Brembo, Alcon etc etc etc. I finally decided on the Alcons. 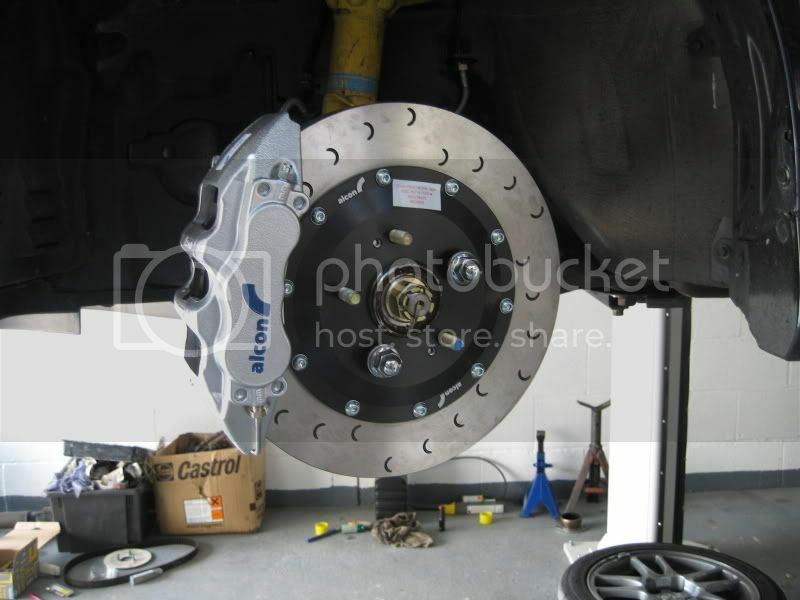 The Alcons were available in a 6 pot monoblock caliper but more importantly they had the largest possible disc to fit behind my OEM 17" wheels. 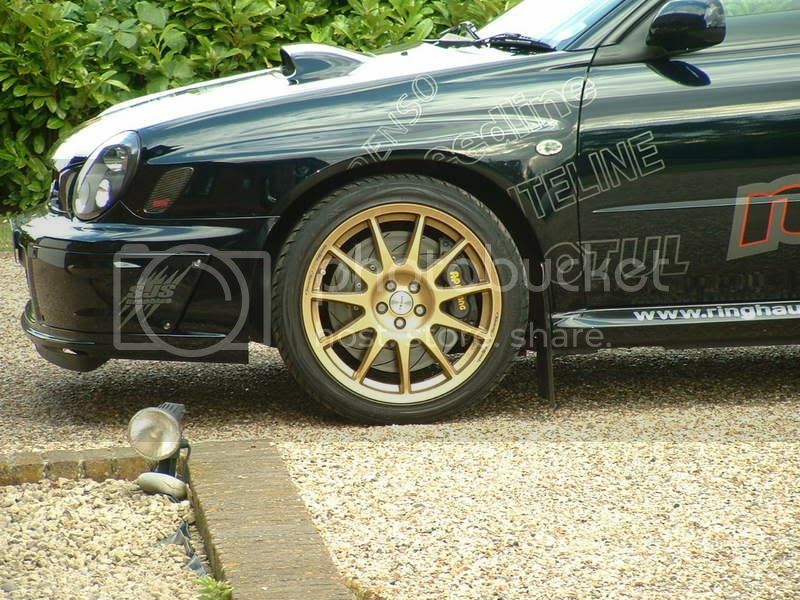 Alcon had a setup with 343mm fully floating discs which i really liked the look of. 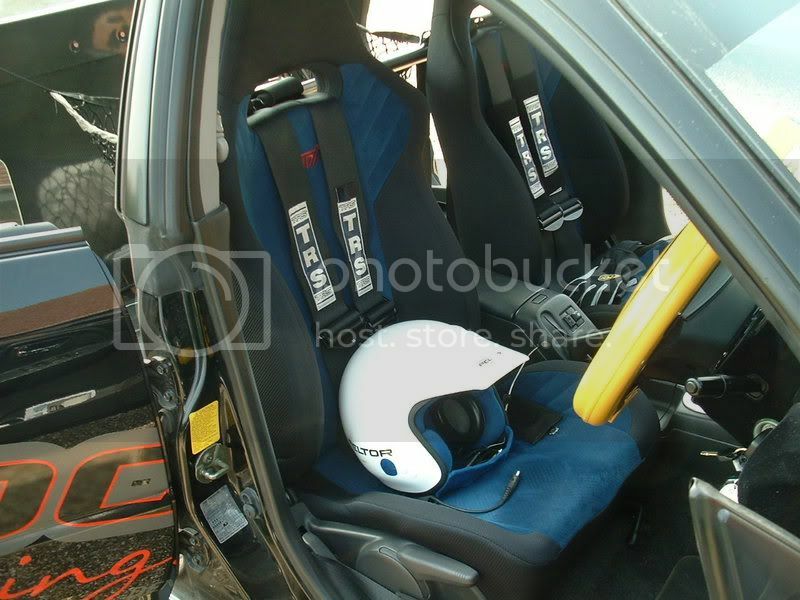 I contacted EARS motorsport and promptly ordered the setup. The setup arrived about a fortnight later. Eager to get them on it took a day off work to go to Mocom to fit the new stoppers. However unpacking the boxes, theer was one fundemental problem, they had sent me a 4pot kit instead of the 6 pots i had originally ordered. I called them and explained my issue. However i was told that Alcon currently had a huge order being processed for Bentley cars and i wouldnt have another set for 14 days. A little disheartened i accepted that that was that and i would have to wait. A month goes by and i eventally get my 2nd set. Again i take a day off and rush down to Mocom to get the new brakes on. Unwrapping the boxes like a 5 year old at christmas there ware my lovely 6 pots. However, the discs looked huge, and sure enough they had sent me the 370mm setup. I checked the boxes and not only were they the wrong diameter but the PCD on the bells were wrong. By this point im absolutely fuming, once again a call and explain my problems. I was told that they would have a set especially made for me ASAP and i also asked for a 2nd set of pads for my troubles. I then waited another month for the 3rd set to be made. EARS assured me that they would trial fit my brakes to a Subaru in the work shop to ensure they were perfect before they were deliverd to me. Reluctantly i agreed, id waited that long, what was another few days going to hurt. Sure enoght EARS received my 3rd set and called me to explain their findings. Basically they didn't fit, they needed 2.9mm removed from the radial mount to bring the calipers closer to the hub and then they wanted me to run 7mm spacers in order make them fit under my wheels. Ive told them to poke the brakes and that i wanted my money back!! It had been 9 weeks now and after 3 sets of brakes which cost me £1800, im not prepared to settle for anything less. I said funk it and ditched the 17s and ordered a set from AP Racing. 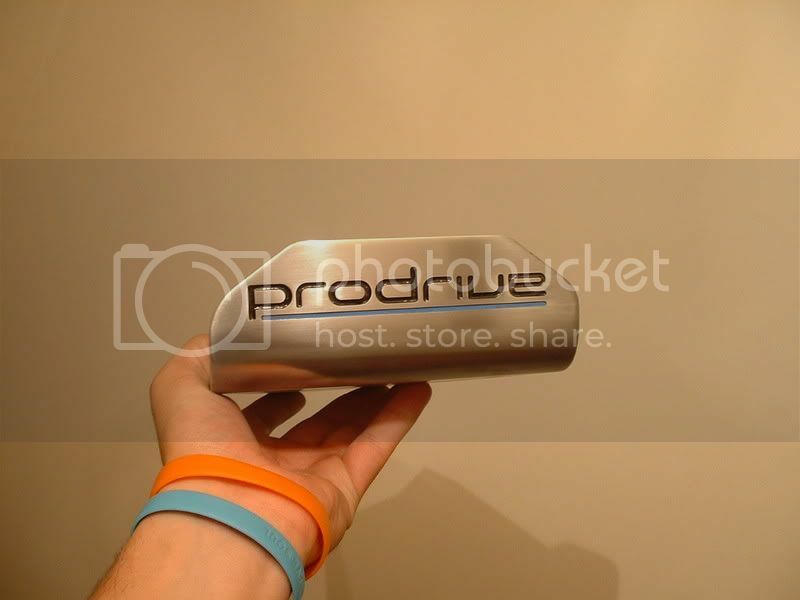 I ordered their 356mm 6 pots. Sure enough they wered delivered promptly and when i fitted them they were perfect. My dealings with Alcon disgusted me and i would unfortunately never be able to recomend them to anyone. I just wish i had bought the APs in the first place, but hey, we live and learn. 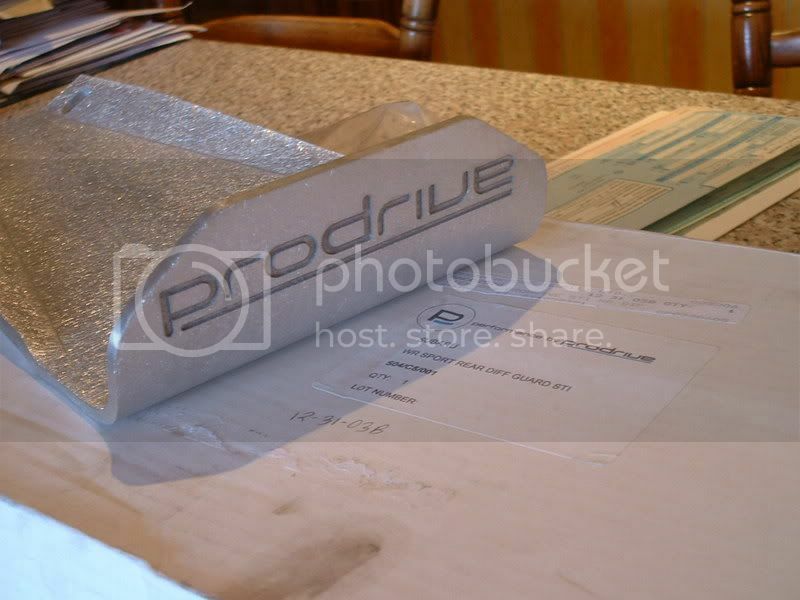 As a treat to getting teh car home i purchased a Prodrive diff guard. When it arrived it was in a plain machined finish. After the ring trip i decided to order some coilovers too. I opted for KW variant 3's with piggyback canisters. These were to be custom made in Germany. 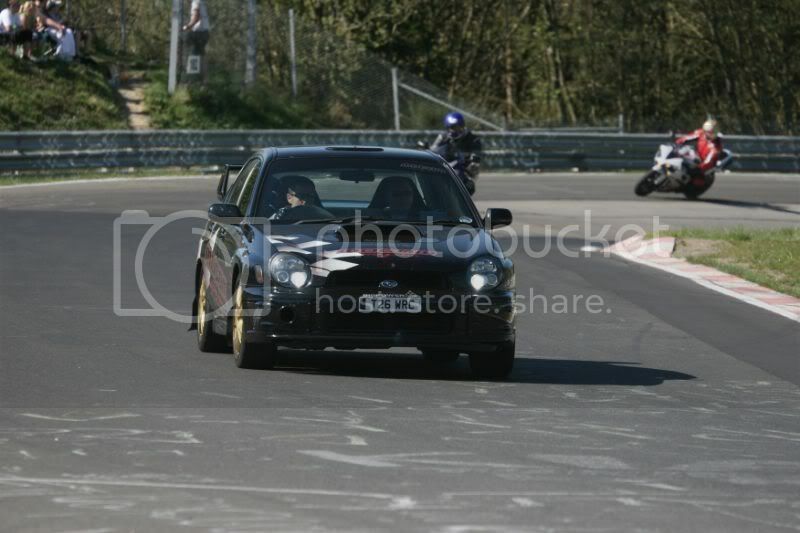 Another thing i decided in Germany was that i really wasnt happy with the volume of the exhaust. Last edited by frayz; 13 March 2008 at 02:29 AM. I am really really enjoying this thread mate. I will agree with what others have said, this is probably my favourite car on the WHOLE forum. 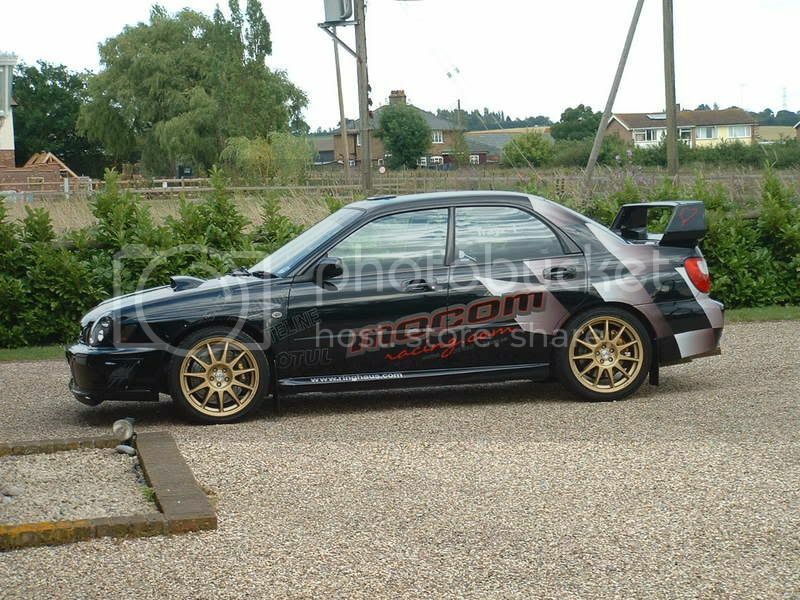 I am a die hard classic fan all the way, more precisely Type-R's, but your car is just pure Subaru ****. 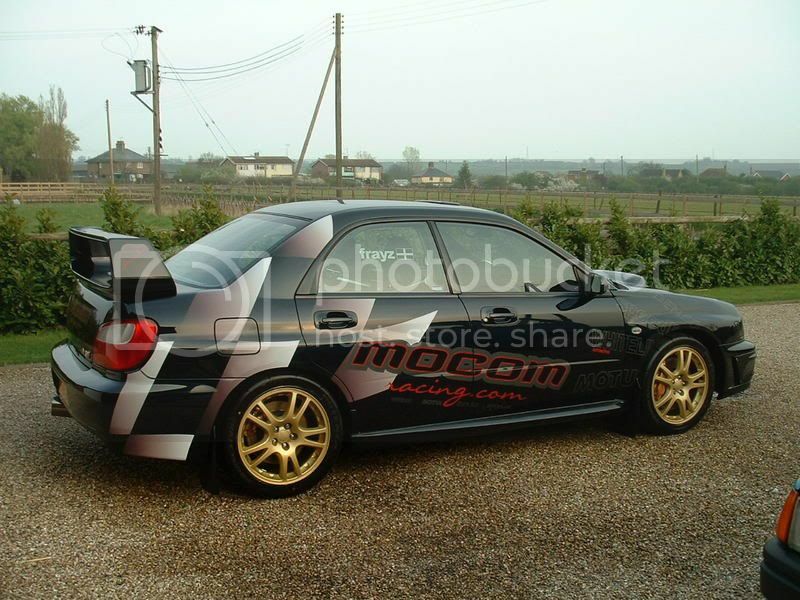 The fact you have done it all bit by bit as you can afford it goes to show as well that you dont have to have mega bucks to mod and afford to run a car like this. A good 'role model' if you will of decent, tasteful and enviable modding and something for us all to strive toward. Its nice to be able to help inspire others as others have inspired me. Once again, thankyou for all the comments, its great to hear feedback and interesteing even for me to collate the whole car build in one thread. I Still remember seeing Frayz car at Zaks after returning from the Ring. Zak had to move it out of the worksgop to get mine in and it had a BIG sign on the steering wheels saying "NO BRAKES!!!" Frayz - I did tell you AP brakes all the time from the first time you mentioned BRAKE UPGRADE!!! loving this read up, even tho I know everything you've done and the current spec its still amazing to see it all taking shape and the huge amount of money you have lovingly splashed on the car. its really good to see some1 doing it properly and not cutting corners by trying to save money only to end up paying more at a later date. Your research into everything you plan is articulate and in doing so has made you a very valuable person to ask question/advice on now. 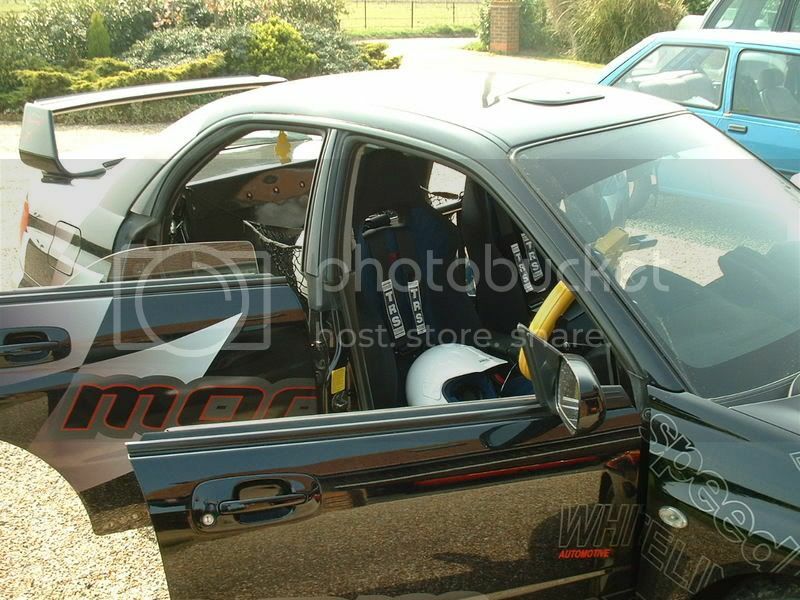 I genuinely dont think anyone will want a car this modified mate. I think its something that will either be broken for parts or taken to the grave. That'll be a shame Simple answer, don't sell it! 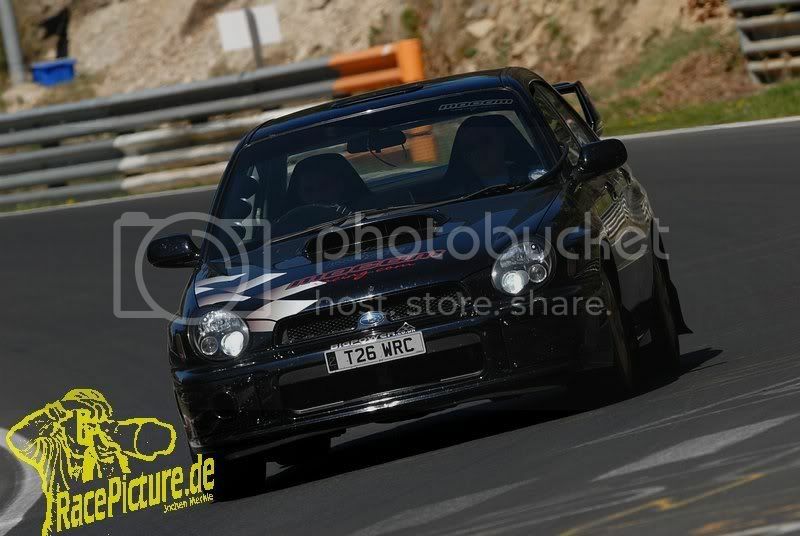 Another issue highlighted to me whilst at the ring was the sheer volume of the car. 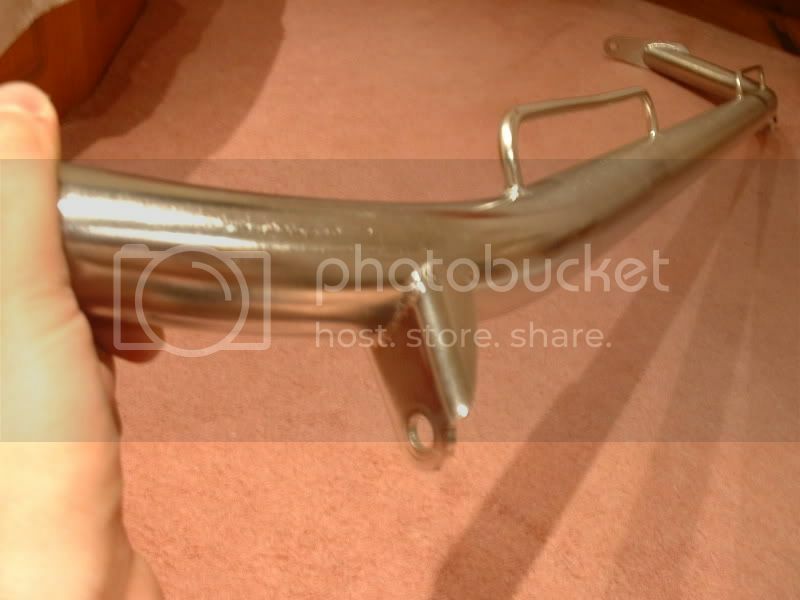 So i decided to get a proper exhaust syestem made onec and for all. The OEM system was too restrictive but nice and quiet. The 2.5 Hayward & Scott was too raspy and loud and agin too restrictive. The 3" is system was still way too loud and had quite afew flaws for what i wanted. I didnt like the fact that it was too loud for track work, and it was heavier than I wanted it to be. The 3" system was putting out a staggering 109dB static @ 4000rpm. This was over all but the most lenient of track noise regs. Being an ex Fordy i had previous knoledge of a compant called Primary Designs. I spoke to them regarding making me a bespoke system and they seemed quite keen. The car was booked in a months time and ready to go. 2 days before the car was due to go in i called the guys there to check what time i should arrive. Only to be told that they couldnt do it due to a new ramp being installed and that the original price i was quoted had now doubled! We're talking way over 4 figures here. I was pretty disgusted at how they had acted, as i dare say i would not have even been told had i of not called to check my booking. 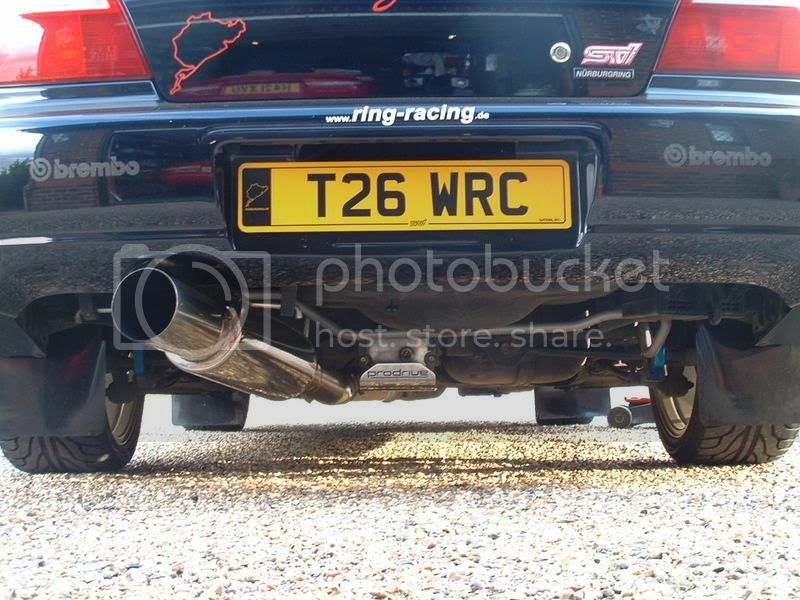 Sod it, so i sacked that idea off and called Matt @ Simpson Race Exhausts in Slough. Matt was very helpful and was happy to listen when i discussed exactly what i wanted from my system. -Be as quiet a feasibly possible without restricting flow. My requiremnts were high and my expectations were even higher. But when you're paying good money, you expect a good job. One other thing i mentioned to Matt was to have the outlet pointed down to the floor at a 45 degree angle just like the big powered scandinavian racecars and mental Group B rally cars of the 1980's. 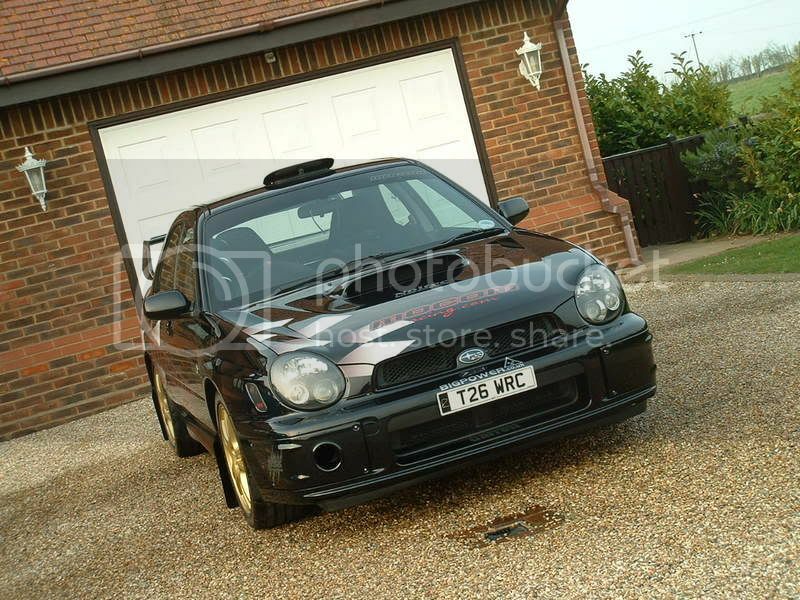 This was a big gamble for me as i knew it had not been don on an Impreza to my knoledge before and if it looked wrong it could take the shine off of a very expensive exhaust system. Matt knew exactly what i was aiming for and said that i would be suitably impressed... i sure hoped so. A few weeks went by and i got the call to say the car was ready. Needless to say i was very nervous, how could i be nervous about an exhaust system lol. To say i was delighted with the finished article was a huge understatement. The work the guys had done was by my standards absolutely impecable. The fit and finish was amazing, the look was right, the sound was right and more importantly it was only 91.5dB ststic @ 4500rpm. Fantastic. 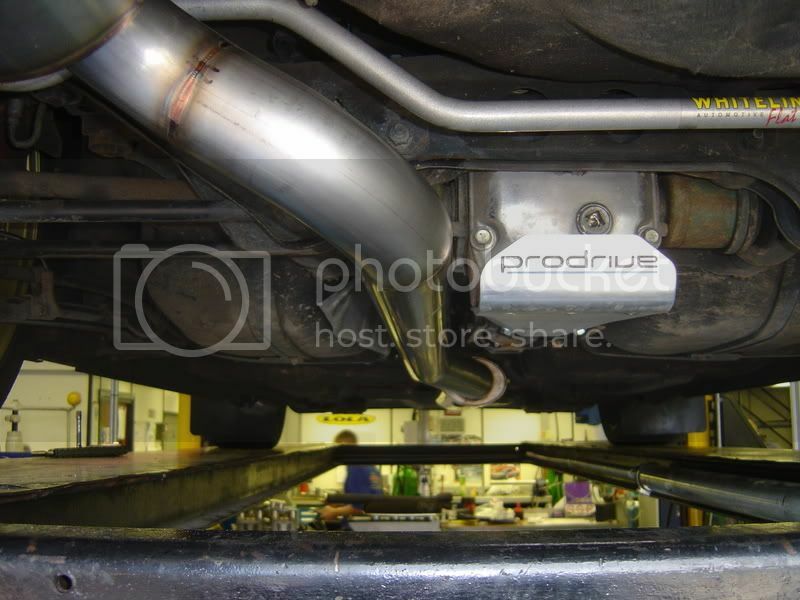 The system pipework had been made from 0.6mm lightweight stainless, the only joint in it was connected with a V-Band clamp for seamless flow, there wass a 5"x7" race silencer in the centre and a 7" dia repacakable race silencer at the rear. 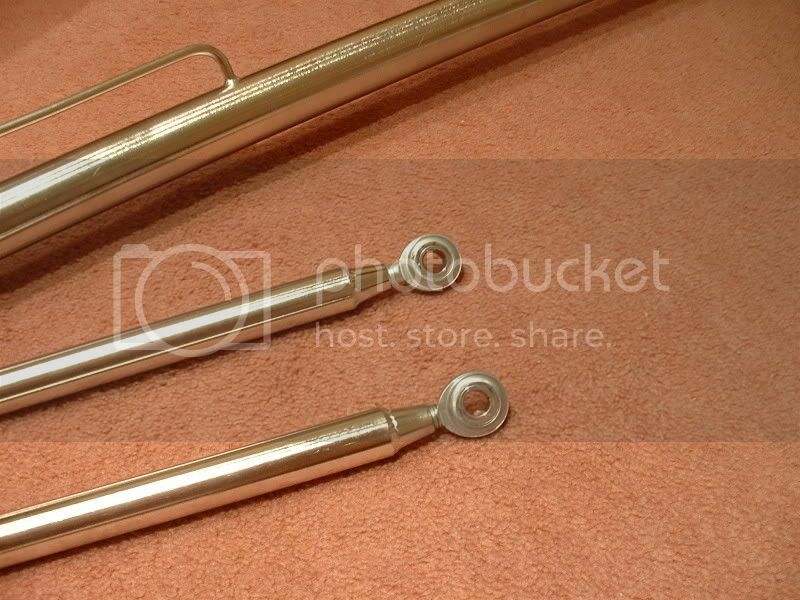 Even the hollow lightweight hangers had little split pins through them for added security. I was suitably chuffded and my gamble had again paid off, the look was absolutely awesome. 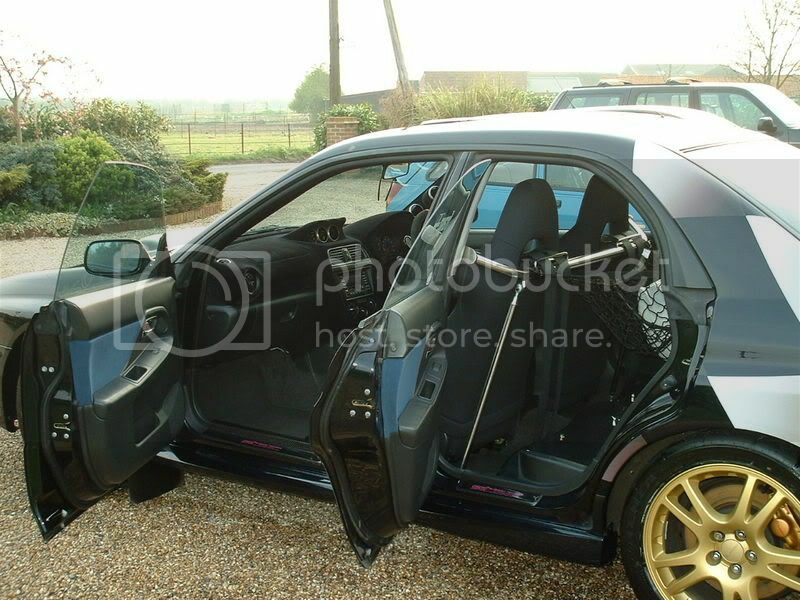 The 4 figure pricetag was worth every penny imo, and my track focused car was getting ever closer to my dream spec. Coming up in round 12 sees more carbon of a different kind and future plans.